ISO 9001:2015 Lead Auditor Course teaches the principles and practices of effective audits in accordance with ISO 19011, “Guidelines on Auditing Management Systems“. As bonus, you get a detailed clause by clause explanation of ISO 9001:2008 in simple and plain terms. The aim of this course is to provide students with the knowledge and skills required to perform first, second, and third party audits of quality management systems against ISO 9001, in accordance with ISO 19011 and ISO/IEC 17021. Context of the organization Risks and opportunities; QMS scope; Quality policy and objectives; infrastructure; competence; awareness; measuring and monitoring resources; documented information; design and development; customer communication; reviewing customer requirements; property belonging to customers or external providers; preservation; control of externally provided processes, products and services; identification and traceability; post-delivery; release of products and services; nonconforming outputs; customer satisfaction; internal audit; nonconformity and corrective action or management review. Explain the purpose, content and interrelationship of the ISO 9000 family of Standards. 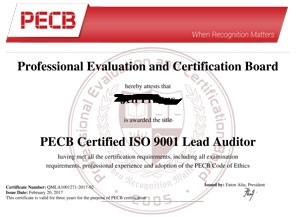 PECB Authorized ISO 9000-9001 Auditor Training Partner. Call 021-34986664.